I try to come up with original ideas for my scripts. Maybe something entirely new, or at least slightly different from something else. Example – how many scripts have you seen about a Jewish cook in a Chinese restaurant? See? A few days ago, it was reported that THE LONE RANGER had been scrapped due to a bloated budget, not to mention a ludicrous storyline involving werewolves(?!) 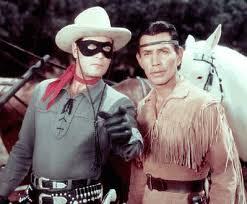 and that it would focus more on Tonto. I don’t have time to go into why all of these are WRONG to begin with, but I just found out that the new draft is going to feature three major sequences involving TRAINS. Apparently Mssrs Rossio and Elliott are tapping into my mind and extracting the ideas. Yes, I know there are only so many ideas floating around out there, but this isn’t the first time there’s been a weird connection between me and them. A few years ago, I came up with what I thought was an original idea story about zombie pirates terrorizing a coastal town. Just as I’m finishing up my initial outline, I read that Disney’s tentpole release for the following summer is PIRATES OF THE CARIBBEAN (the first one). I sally forth and get a draft done. By now, their movie has come out and is a huge smash. Knowing there will be a deluge of similar scripts, I change my villains from pirates to cowboys. I crank out a draft, create a clever query letter campaign, but no interest. That script is in a virtual filing cabinet now, waiting to be retrieved and rewritten at some later date. Once I’m done with my DREAMSHIP rewrite, I’ll get to work on LUCY, even though it may now be an even harder uphill climb. But I still like the story, and think it would make for an impressive script. And just think, maybe someday in the future, you’ll catch the latest hit from Rossio & Elliott and be able to say “I bet that was Paul’s idea first.” And chances are you could be right. Especially if it’s THE 3 STOOGES: UNDERCOVER G-MEN!. Then all bets are off. This new interpretation of John Reid and Tonto will probably never see the light of day, and after the disaster that was Reid’s nephew’s movie, we can be glad. Stay the course!